Refinements in surgical techniques and advances in immunosuppression have led to steadily improving results in pancreas transplantation. The first simultaneous kidney-pancreas transplant (SKPT) was performed at Wake Forest Baptist Medical Center on March 6, 1992. Exocrine drainage was performed with bladder drainage. However, the patient required enteric conversion on December 20, 2007, for persistent problems related to bladder drainage including metabolic acidosis, dehydration, recurrent urinary tract infections, and episodes of gross hematuria requiring blood transfusions. The patient's kidney failed in 2008 secondary to chronic allograft nephropathy and she received a second deceased donor kidney transplant on June 1, 2010. However, her original pancreas allograft continues to function well with excellent glycemic control almost 19 years following transplantation. No other pancreas transplantations were performed at our center until November, 2001. From November 1, 2001, through July 30, 2010, a total of 156 pancreas transplantations were performed in 147 patients, including 121 SKPT, 31 sequential pancreas after kidney (PAK), and 4 pancreas alone (PA) transplantations. Of the 9 (5.8%) pancreas re-transplantations, 6 were carried out after prior SKPT, 2 were PAK re-transplantations, and one was an SKPT re-transplantation. All transplantations were performed with enteric drainage to the proximal ileum in the recipient (side to side duodeno-enterostomy, usually without a diverting Roux limb). 139 transplantations were performed with portal and 17 with systemic venous drainage. Diverting Roux limbs were used rarely, and only if the donor duodenum did not reperfuse well. Of the 17 (10.9%) transplantations performed with systemic-enteric drainage, 7 were pancreas re-transplants, in which the initial pancreas transplantation was performed with portal-enteric drainage. Other indications for performing systemic-enteric drainage included one female and 6 male patients with a high body mass index (BMI > 30 kg/m2) and 3 patients with small (<6 mm in diameter) mesenteric veins. In patients (particularly male) with a higher BMI, the mesenteric vein can be quite deep in the mesentery and the donor common iliac artery bifurcation "Y" graft may not be long enough to reach the recipient’s iliac artery through a window in the distal ileal mesentery (even with the liberal use of a donor artery "extension" graft). In these cases, systemic venous drainage was performed to simplify the procedure. Of the 121 SKPTs, all but two were performed by transplanting the kidney to the left iliac vessels and the pancreas to the right common or external iliac artery. However, our most recent 10 SKPTs since July 30, 2010, were performed with ipsilateral placement of the kidney and pancreas to the right iliac vessels to reduce operating time. All but 5 pancreas transplants have been obtained from brain-dead donors. Five SKPTs were performed from donation after cardiac death donors at our hospital in which extracorporeal support was used to assist in management of the donor after declaration of death by cardiocirculatory arrest [1, 2]. The first 37 patients received alternate day rabbit anti-thymocyte globulin (rATG) induction (1.5 mg/kg/dose, total 3-5 doses) in combination with tacrolimus (TAC), mycophenolate mofetil (MMF), and tapered corticosteroids . Subsequently, 5 patients received a single dose (30 mg) of alemtuzumab induction intra-operatively, 4 received both single dose alemtuzumab and rATG induction, and 16 received rATG induction only. During this transitional period, 6 of these patients underwent early steroid elimination. From February 2005 through February 2009, 52 SKPT recipients (50 with portal-enteric drainage) were enrolled in a single center randomized trial comparing single dose alemtuzumab (30 mg intra-operatively over 2 hours) and multiple dose rATG (5-6 mg/kg cumulative dose) induction in combination with TAC, MMF, and early steroid elimination . rATG induction was administered on an alternate day basis. Tacrolimus was started immediately post-transplant at a dose of 1-2 mg twice daily every 12 hours. Tacrolimus dosing was titrated to achieve a 12 hour trough level of 10-12 ng/ml for the first 3 months post-transplant, then 8-10 ng/ml thereafter in the absence of rejection or toxicity. Administration of oral MMF was initiated immediately after transplantation at a dose of 500 mg twice daily. After rATG induction was completed, the MMF dose was increased to 2 gm/day in 2-4 divided doses. The MMF dose was reduced in patients with gastrointestinal intolerance or myelosuppression. After the first 3 months, the usual MMF dose was 1.5 g/day in the absence of rejection. Corticosteroids were administered either as intravenous methylprednisolone 500 mg or intravenous dexamethasone 100 mg during surgery with subsequent doses given as premedication for rATG. Steroids were completely stopped on post-operative day 5 in the absence of delayed (kidney) graft function, inadequate TAC levels, or allosensitization (pre-transplant panel reactive antibody (PRA) level > 20%). All patients received anti-infective prophylaxis with fluconazole, valganciclovir, and trimethoprim-sulfamethoxazole. Peri-operative antibiotic prophylaxis consisted of a single pre-operative dose, an intra-operative dose, and 2-3 post-operative doses of cefazolin (1 gram intravenous). Patients received single-strength trimethoprim-sulfamethoxazole, 1 tablet every Monday-Wednesday-Friday for at least 12 months as prophylaxis for Pneumocystis jiroveci. Anti-fungal prophylaxis consisted of oral fluconazole (200 mg/day) for 1-2 months. Anti-viral prophylaxis included oral valganciclovir 450 mg/day for 3 months (with dosage adjustments for renal dysfunction and leukopenia) when either the donor or recipient was cytomegalovirus (CMV) seropositive or both were CMV seronegative. If the donor was CMV seropositive and the recipient seronegative (primary CMV exposure), oral valganciclovir 900 mg/day (with dosage adjustments as above) was given for 6 months. Anti-platelet therapy, consisting of oral aspirin (81 mg/day), was administered to all patients. In solitary pancreas transplant (SPT) recipients, 2,500 units of intravenous heparin was administered as a single dose during surgery prior to implantation of the pancreas. Also, a heparin infusion was continued post transplantation (continuous infusion of 300 units/h for 24 h, then 400 units/hour for 24 hours, and then 500 units/h until post-operative day 5) in the absence of bleeding. Oral warfarin, in a daily dose of 1 mg, was administered to patients requiring prolonged vascular access, or to those with subsequent placement of a permanent central venous catheter. Most patients were discharged from the hospital after placement of a permanent central venous catheter to receive intravenous fluid and electrolyte supplementation at home for a variable period of time. Treatment of hypertension, hyperlipidemia, anemia, diabetes, and other medical conditions was initiated as indicated, aiming to maintain blood pressure < 140/90 mmHg, fasting serum cholesterol < 200 mg/dl, hematocrit > 28%, and fasting blood sugar < 126 mg/dl. The diagnosis of renal allograft rejection was suggested by an unexplained rise in serum creatinine level of > 0.3 mg/dl or a 25% increase from baseline level, and confirmed by ultrasound-guided percutaneous biopsy. Banff criteria were used to determine the grade of rejection . Since March 2008, all SKPT patients underwent both reperfusion and 1 month surveillance kidney biopsies unless there was a specific contraindication. Banff grade Ia renal rejection episodes were treated with 3 steroid boluses and/or oral prednisone recycle. Banff grade Ia renal rejection episodes without biochemical evidence of improvement or unresolved infiltrates on a repeat biopsy within 2-4 weeks (persistent or steroid-resistant rejection) were treated with rATG rescue therapy. Banff grades Ib, II, and antibody-mediated renal rejection episodes were also treated with rATG for 5-7 doses depending on biochemical and clinical response. Most patients underwent a 1-month follow-up biopsy after treatment of rejection to document histological improvement. The diagnosis of pancreas allograft rejection was suggested by an unexplained rise in serum amylase, lipase, or glucose levels, and confirmed by ultrasound-guided percutaneous biopsy. Treatment of rejection was based upon the Maryland Classification System , and more recently the Banff 2007 schema . Both systems take into account the presence and severity of lymphocytic inflammation, endotheliitis, eosinophilia, acinar or ductal inflammation, and arteritis. Borderline and mild pancreas allograft rejection episodes were treated with steroids, whereas all other grades of pancreas rejection were treated with rATG. Follow-up pancreas allograft biopsies were performed to document histological improvement and response to therapy. In the randomized study assessing alemtuzumab versus rATG in SKPT, 29 patients (56%) received alemtuzumab and 23 (44%) received rATG induction. There were no significant differences between the 2 groups regarding donor, recipient, or transplant characteristics except that the mean duration of pre-transplant diabetes (32 years alemtuzumab versus 27 years rATG, p = 0.07) was slightly lower in the rATG group. The mean waiting time for the transplant was slightly lower in the alemtuzumab group (mean 6 months alemtuzumab versus 11 months rATG, p = 0.10). There were no significant differences between the 2 groups in 1-year patient survival rate (92% alemtuzumab versus 100% rATG) or overall patient survival rate (92% alemtuzumab versus 92% rATG). The same applies to the comparisons of 1-year kidney graft survival rate (91% alemtuzumab versus 92% rATG) to overal1 kidney graft survival rate (87% alemtuzumab versus 85% rATG), and 1-year pancreas graft survival rate (87% alemtuzumab versus 92% rATG) and overall pancreas graft survival rates (83% alemtuzumab versus 92% rATG); all p = NS. The first-year and overall acute rejection rates (both 17% alemtuzumab versus 39% rATG, p = 0.10) were slightly lower in the alemtuzumab group. There were no differences in surgical complications, re-admissions or re-operations between groups. Post-operative bleeding was slightly higher in the alemtuzumab group (9% alemtuzumab versus 0% rATG, p = 0.3). The one year rates of overall infection (36% alemtuzumab vs 67% rATG, p = 0.09) were slightly lower in the alemtuzumab group. CMV infections were significantly lower in the alemtuzumab group (0 alemtuzumab versus 15% rATG, p = 0.04), whereas bacterial and fungal infections were slightly lower in the alemtuzumab group. One year mean serum creatinine (mean 1.1 vs. 1.2 mg/dl), mean calculated abbreviated modification of diet in renal diseases (MDRD) glomerular filtration rate (GFR; 57 ± 16 vs. 55 ± 14 ml/min), and glycohemoglobin (5.2% vs. 5.1%) levels were similar in the alemtuzumab and rATG groups, respectively. Based on this study, we concluded that excellent results can be achieved with either alemtuzumab or rATG induction in SKPT, although alemtuzumab may be associated with less acute rejection, fewer infections, and more bleeding complications. Since February 2009, all pancreas transplant recipients at our center have received alemtuzumab induction with TAC, MMF, and early steroid elimination. Although alemtuzumab and rATG are the most commonly used T-cell-depleting induction agents in SKPT in the United States, few data are available on outcomes using these agents in African-American (AA) recipients. From 2/2/02 to 10/31/10, we performed 122 SKPTs including 26 (21%) in AA recipients. From 2002-2005, 9 AA patients received induction with alternate day rATG. From 2005-2009, 12 AA patients were prospectively randomized to receive rATG versus single dose alemtuzumab (30 mg intra-operatively). Since 2009, 5 AA patients received alemtuzumab induction exclusively. All patients received TAC and MMF. Immunological risk stratification (PRA > 20%, re-transplant, or AAs < 40 years of age were considered high immunological risk) was used to determine steroid maintenance (in high risk) or early steroid elimination (in low risk patients). Of 26 AA patients, 12 received alemtuzumab and 14 rATG induction. Mean recipient age (45 years alemtuzumab versus 39 rATG), gender (65% male), weight (mean 72 kg), duration of diabetes (mean 20 years), and dialysis duration (mean 27 months) were similar between groups. Similarly, pre-transplant HbA1c levels (mean 9.3%) were comparable. Detectable pre-transplant C-peptide levels were present in 4 (mean 3.7 ng/ml) and 3 (mean 6.4 ng/ml) patients in the alemtuzumab and rATG groups, respectively, suggesting a type 2 diabetes phenotype. With a mean follow-up of 27 months in the alemtuzumab and 62 months in the rATG groups, actual patient (100% alemtuzumab versus 93% rATG), kidney (92% alemtuzumab versus 50% rATG, p = 0.036), and pancreas (83% alemtuzumab versus 57% rATG, p = 0.22) graft survival rates favored the alemtuzumab group. Two year survival rates were all 100% in the alemtuzumab compared to 93% patient, 86% kidney, and 79% pancreas graft survival rates in the rATG group (all p = NS). Initial lengths of hospital stay were 9.8 versus 10.4 days (p = NS), but the early re-laparotomy rates were 25% versus 50% (p = 0.25), in the alemtuzumab versus rATG groups, respectively. The incidence of acute rejection was 16.7% in the alemtuzumab compared to 50% (p = 0.11) in the rATG group. Five patients in the former versus 4 in the latter group are currently steroid-free (35% of total cohort). In patients with functioning grafts, most recent serum creatinine (mean 1.2 mg/dl alemtuzumab versus 1.6 rATG) and glomerular filtration rate (GFR; mean 58 ml/min alemtuzumab versus 53 rATG) levels were comparable. The same applies to most recent C-peptide (mean 3.0 ng/ml alemtuzumab versus 4.1 rATG) and HbA1c levels (mean 5.5% in both groups). The most common cause of kidney graft loss was rejection (6 of 8 cases), whereas causes of pancreas graft loss included early thrombosis (2), chronic rejection (2), and insulin resistance (4 cases, 3 of which had detectable pre-transplant C-peptide levels). Rates of pancreas graft loss (excluding early thrombosis) were 43% versus 18% (p = 0.31) in the presence and absence of detectable pre-transplant C-peptide levels, respectively. Based on these findings, we concluded that both alemtuzumab and rATG induction were associated with good initial outcomes in AA recipients of SKPT, some of these may be successfully managed with early steroid elimination. Alemtuzumab induction seemed to be associated with a reduction in early morbidity. Detectable pre-transplant C-peptide levels were not a contraindication to SKPT, but may be a risk factor for subsequent pancreas graft failure. Recently, type 2 diabetes was a contraindication to pancreas transplantation. 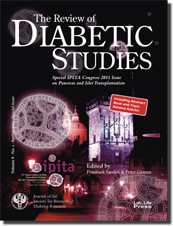 However, initial intentional (and unintentional) experience with SKPT in patients with type 2 diabetes and end stage renal disease showed that augmentation of endogenous insulin production through pancreas transplantation in patients with C-peptide positive, insulin-requiring diabetes resulted in insulin independence, improved glucose counter-regulation, and enhanced quality of life. There may be tremendous overlap in the "definitions" of type 1 versus type 2 diabetes, which are historically differentiated based on age and pattern of onset, detection of C-peptide and islet/anti-glutamic acid decarboxylase (GAD-65) antibodies, initial need for insulin and total daily insulin dose, presence or absence of diabetic ketoacidosis, obesity, ethnicity, human leukocyte antigen (HLA) association, and other associated auto-immune phenomena. To add to the confusion, it is well known that the immunosuppressive medications requisite to transplant may cause type 2 diabetes. Single-center and registry reports have documented equivalent SKPT outcomes in patients with either type 1 or type 2 diabetes, although a selection bias exists for patients in the latter category . Selection criteria for SKPT in type 2 diabetes included patients < 55 years of age with a BMI < 30 kg/m2, insulin-requiring for a minimum of 5 years with a total daily insulin requirement < 1 U/kg/day, fasting C-peptide level < 10 ng/ml, absence of severe vascular disease and tobacco abuse, adequate cardiac function, and presence of "complicated" diabetes. SKPT is associated with a shorter waiting time, enhanced donor quality, increased life expectancy, higher graft survival, improved quality of life, and better preservation of renal function compared to deceased donor kidney transplantation only. Therefore, characterization of the "type" of diabetes may be irrelevant. All insulin-requiring diabetic patients should be evaluated for SKPT based exclusively on their predicted ability to tolerate the surgical procedure (which has a higher inherent complication rate compared to kidney transplantation only), including requisite immunosuppression and compliance with a more stringent post-transplant follow-up regimen compared to kidney transplantation only. - and had a greater proportion of AAs (57% in group B versus 13% in group A, p = 0.004). Pre-transplant duration of diabetes (mean 17 years in group B versus 25 years in group A, p = 0.01) was shorter in group B, but duration of dialysis (median 40 months in group B versus 14 months in group A, p = 0.14) was longer. There were no significant differences between the two groups with regard to dialysis status, PRA, HLA-matching, and other pertinent characteristics. With a mean follow-up of 32 months in group A compared to 36 months in group B (p = NS), death-censored kidney (95% group A versus 100% group B, p = NS), and pancreas (89% group A versus 100% group B, p = NS) graft survival rates were similar between groups. However, patient survival rate (94% group A versus 71% group B, p = 0.096) was slightly lower in group B. The 2 deaths in group B (1 early, 1 late) were due to a surgical complication and hepatitis C virus with cirrhosis, respectively. At one year follow-up, there were no differences in acute rejection episodes, surgical complications, major infections, re-admissions, hemoglobin A1c and C-peptide levels, or serum creatinine and calculated MDRD GFR levels between the 2 groups. In our preliminary experience, diabetic patients with measurable C-peptide levels at the time of transplant appear to have a type 2 diabetes phenotype (older, overweight, more frequently AA, later age of onset, shorter duration of diabetes, and longer duration of pre-transplant dialysis). They also had reduced patient survival compared to insulinopenic patients undergoing SKPT. However, other outcomes were similar between the groups (Table 1). Consequently, C-peptide levels are currently not used to determine candidacy for SKPT at our center. Legend: Data are number and percentage, or mean/median ± SD. AA: Afrian-American. CMV: cytomegalovirus. D: donor. R: recipient. D+: donor CMV-positive. R -: recipient CMV negative. Tx: transplantation. We reviewed our experience in SKPT with respect to extended donor and recipient criteria . Over a period of 65 months, we performed 83 SKPTs with enteric drainage (79 portal-enteric). Extended donors were defined as age < 10 (n = 4), ≥ 45 (n = 12, mean age 50.2 years), or donation after cardiac death (n = 4). Extended recipients were defined as age > 50 (n = 16, mean age 55.8 years), or pre-transplant serum C-peptide level >2.0 ng/ml (n = 3, mean 5.7 ng/ml), or both (n = 4). Twenty donors (24%) and 23 recipients (28%) met the aforementioned extended criteria. Median waiting time was 10 months, mean pancreas preservation time was 17 hours, and median length of stay was 10 days. With a mean follow-up of 32 months, patient survival rate (95% extended donor versus 94% non-extended donor), kidney survival rate (90% extended donor versus 89% non-extended donor), and pancreas graft survival rate (85% extended donor versus 81% non-extended donor) were similar between donor groups (p = NS). Regarding recipient groups, patient survival rate (87% versus 97%, p = 0.13) and kidney graft survival rate (87% versus 92%) were slightly lower in the extended recipients, compared with the non-extended recipient group, respectively. Uncensored pancreas graft survival rates (83% extended recipient vs. 82% non-extended recipient) were similar. In 6 extended recipients receiving organs from extended donors, patient and kidney graft survival rates were 83% and pancreas graft survival rate was 67%. The incidences of delayed kidney graft function, pancreas thrombosis, acute rejection, surgical complications, infection, and other morbidities were comparable regardless of donor or recipient group. At one year, the extended recipient group demonstrated slightly compromised renal and pancreas allograft function and a greater need for oral hypoglycemic agents. In conclusion, medium-term outcomes in SKPT from selected extended donors or recipients are comparable. These results demonstrate that the limits of donor acceptability continue to evolve in SKPT. We remain reluctant to expand donor criteria for SPT, and prefer to wait for an “ideal” donor with good HLA-matching in these patients. However, when comparing extended with non-extended pancreas donors, outcomes in SKPT are similar. We no longer regard the abovementioned extended criteria as contraindications to SKPT. Based on this study, it is no longer appropriate to exclusively consider donor age or donation after cardiac death as reasons for donor pancreas refusal. Although pancreas transplantation in extended recipients is feasible, extended recipient criteria may represents a risk factor for reduced patient survival and graft dysfunction. 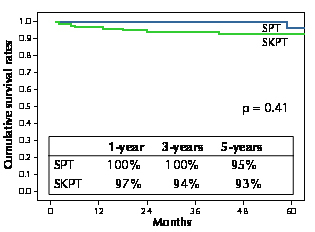 Compared to SKPT, SPT is associated with higher rates of acute rejection, immunologic pancreas graft loss, and lower pancreas graft survival rates even with antibody induction and contemporary immunosuppression [11, 12]. Serum creati-nine and urinary amylase levels are not available as markers of rejection in enterically drained SPTs. Additionally, serum amylase and lipase levels are not always reliable indicators of pancreas allograft rejection, and do not correlate with rejection grade. Due to the challenges of diagnosing rejection in SPT, we routinely perform surveillance pancreas biopsies in SPT recipients . We performed a retrospective analysis of all SPT and SKPTs performed at our institution from 2/02 to 8/10 with T-cell-depleting antibody induction and TAC, MMF, and steroid maintenance immunosuppression. Low immunological risk patients underwent early steroid elimination. A 2-3 HLA-antigen match was preferred for SPT recipients. Following SPT, surveillance pancreas biopsies were performed at 3-week intervals until there were 2 consecutive normal biopsies. More recent biopsies were graded according to Banff 07 schema. Earlier biopsies graded according to the Maryland classification were re-interpreted according to the corresponding Banff 07 grade to facilitate analysis. Episodes of acute rejection that were grade I or higher were treated with pulsed corticosteroids and/or rATG with follow-up biopsies performed every 3 weeks until the inflammation resolved. Biopsies graded as "indeterminate" were managed by optimizing maintenance immunosuppression with follow-up biopsies, as described above. Clinical biopsies were prompted by biochemical parameters. Thirty-five SPT (31 PAK, 4 PA) and 121 SKPTs were performed with a mean follow-up of 5 ± 2.5 years. Twenty-six (74%) SPT underwent at least 1 surveillance biopsy (mean 2 ± 0.9 biopsies/graft). Nine pancreas grafts were not subjected to biopsy due to early thrombosis, infection, or other reasons. Of the 26 pancreas grafts subjected to biopsy, 12 (46%) had some inflammation detected (higher than or equal to indeterminate grade), and 9 (34%) had at least 1 biopsy with acute rejection grade I or higher. Eight of 9 (89%) episodes of acute rejection grade I or higher were subclinical, occurring in the absence of biochemical abnormalities. Demographics for SPT versus SKPT recipients were mostly comparable. 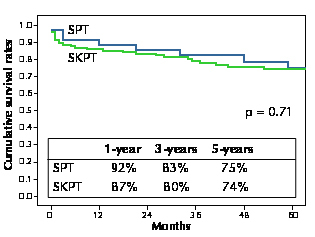 However, the SPT group had fewer HLA mismatches (SPT 3 ± 1.3 versus SKPT 4.5 ± 1.3 mismatches, p < 0.001), younger donors (SPT 22 ± 7.6 versus SKPT 28 ± 12 years, p = 0.004), and proportionally fewer AA recipients (SPT 5.7% versus SKPT 20% AA, p = 0.04). Pancreas graft and patient survival rates are shown in Figures 1 and 2. Causes of pancreas allograft loss were comparable between SPT and SKPT. Cumulative clinical acute rejection rates were also similar between groups (SPT 26% versus SKPT 29%, p = 0.7). African American ethnicity was not associated with higher rates of acute rejection or pancreas graft loss. Figure 1. Graft survival after solitary pancreas (SPT) versus simultaneous kidney-pancreas transplantation (SKPT). Figure 2. Patient survival after solitary pancreas (SPT) versus simultaneous kidney-pancreas transplantation (SKPT). We conclude that there is a significant incidence of early subclinical acute rejection in SPT. The use of T-cell-depleting antibody induction, HLA-matching, careful pancreas donor selection, and surveillance pancreas biopsies in SPT with treatment of early subclinical acute rejection episodes yields excellent long-term pancreas graft survival rates that are equivalent to those in SKPT. Outcomes according to different definitions of "success"
We retrospectively reviewed outcomes of 150 consecutive pancreas transplant recipients at our center according to different definitions of "success". All patients received either r-ATG or alemtuzumab induction in combination with TAC, MMF, and tapered steroids or steroid withdrawal. From November 2001 through December 2009, we performed 115 SKPT, 31 PAK, and 4 PA. With a mean follow-up of 4 years, overall patient survival was 92%. Eight patients died with functioning pancreas grafts. The remaining 4 deaths occurred in patients with prior pancreas (but not kidney) graft loss. The actual kidney graft survival rate was 81.5% and death-censored kidney graft survival was 88%. Causes of kidney graft loss (n = 27) included death with functioning graft (n = 11), chronic allograft nephropathy (n = 8), acute/ chronic rejection (n = 5), polyomavirus nephropathy (n = 2), and thrombosis (n = 1). Seven patients underwent successful kidney re-transplantation such that the dialysis-free rate in surviving patients was 94%. The actual pancreas graft survival (insulin-free rate) was 73% and death-censored pancreas graft survival was 77%. Causes of pancreas graft loss (n = 41) included early (n = 13) or late (>3 months post-pancreas transplant, n = 2) thrombosis, death with functioning pancreas graft (n = 8), acute rejection (n = 4), infection (n = 2), and other causes (n = 12). Seven patients underwent successful pancreas re-transplantation such that the current insulin-free rate among surviving patients is 84%. In the 12 patients with other causes of pancreas graft loss, 3 died, 3 do not have detectable C-peptide levels, and 6 continue to exhibit C-peptide production, although all are insulin-requiring. Using C-peptide production (rather than insulin independence) as the definition of graft survival, the death-censored pancreas graft survival rate is 81%, and the current graft survival rate in surviving patients (including pancreas re-transplants) is 88%. In conclusion, in patients with severe diabetes, excellent medium-term outcomes following pancreas transplantation can be achieved as >90% of patients are alive, >90% of surviving patients are dialysis-free, >80% of surviving patients remain insulin-free, and nearly 90% of surviving patients exhibit C-peptide production. The Wake Forest Baptist Medical Center pancreas transplant experience documented herein chronicles the evolution of our immunosuppressive regimen, donor and recipient selection, and recipient management protocols. Our experience is based on outcomes of multiple prospective and retrospective studies. Relevant literature from other centers is reviewed for comparison and perspective. In a retrospective study, Thai et al. described excellent short-term kidney and pancreas graft survival, and a 30% rejection rate using alemtuzumab induction and TAC monotherapy . There was no comparison group in this series. Magliocca et al. performed a retrospective review of the University of Wisconsin experience with a 2-dose regimen of alemtuzumab induction in SKPT in comparison to historical controls who received basiliximab induction . There were no differences in patient, kidney, and pancreas graft survival between groups. Infection rates were comparable between groups except for a significantly higher incidence of CMV infections in the alemtuzumab-treated patients. This center now uses alemtuzumab induction preferentially in SKPT, but administers only a single intra-operative dose. Our own study comparing alemtuzumab and rATG in SKPT demonstrated lower rejection and infection rates in the alemtuzumab group . This study is the only prospective randomized trial of alemtuzumab induction in the pancreas transplant literature. Although our outcomes have prompted us to use alemtuzumab induction almost exclusively, we would caution against extrapolating these results to patients receiving other maintenance immunosuppression regimens, or to different patient populations. Our experience with pancreas transplantation in type 2 diabetics compares favorably to other reports in the literature. Nath et al. described the University of Minnesota experience with pancreas transplantation in type 2 diabetics . In recipients of technically successful pancreas transplants, 94% were rendered euglycemic in this series. Long-term results were comparable to type 1 diabetic, pancreas transplant recipients. Light et al. reported the Washington Hospital Center 10-year results of SKPT in type 1 and type 2 diabetics, defined by absence or presence of C-peptide, respectively . Similar to our experience, the type 2 diabetics had a higher BMI, were older at the onset of diabetes, and the majority were AA patients. In this study, long-term patient, kidney, and pancreas allograft survival rates were comparable between type 1 and type 2 diabetics. It was concluded that the decision to perform pancreas transplantation in diabetic kidney transplant recipients should be based on general acceptance criteria rather than diabetes type. Our own data supports and confirms this recommendation. The ongoing organ shortage has resulted in increased waiting times for pancreas transplantation and a corresponding increase in the number of poorly controlled diabetics on the waiting list. This has led to renewed interest in the use of extended-criteria donor pancreata. Specifically, organs from donors at the extremes of age and from donors after cardiac death were considered. Concerns that pediatric pancreata have reduced islet mass and may be more prone to technical complications have resulted in reluctance to use these organs. The largest reported series of transplantations using pediatric pancreata demonstrated superior kidney and pancreas allograft survival and similar rates of technical complications compared with adult donors . Based on these data, more widespread use of pediatric pancreata is recommended, particularly from donors older than 3 years of age or greater than 25 kg body weight. At the other extreme, several studies have shown reduced long-term pancreas graft survival with pancreata from donors older than 50 years of age [21, 22]. Although fewer than 5% of all pancreas transplants are obtained from donors after cardiac death, there are recent reports of excellent long-term graft survival with pancreata from donors after cardiac death, comparable to that of pancreata from brain dead donors [23, 24]. However, the incidence of delayed kidney graft function was significantly higher in recipients of organs from donors after cardiac death in these studies. Although our center's experience with extended-criteria donor pancreata is relatively small, we have had excellent results using pancreata from pediatric donors and donors (particularly female gender) over 45 years of age. Similarly, our results with pancreas transplantations from donors after cardiac death have been excellent as well. Interestingly, we have had no cases of delayed kidney graft function in SKPT with use of extracorporeal support during donor management in contrast to the higher incidence of delayed kidney graft function reported in the literature. Pancreas utilization and outcomes from donors after cardiac death may be enhanced by broader use of extracorporeal support in donor management. However, further investigation and experience is required. The potential risks and benefits of utilizing pancreata from extended-criteria donors in an individual patient must be weighed against the morbidity and mortality associated with remaining on the waiting list. Late immunologic pancreas graft loss continues to be a problem in SPT, even with use of T-cell-depleting antibodies and contemporary immunosuppression. In our experience, surveillance pancreas biopsies in SPT have revealed a high incidence of subclinical rejection, allowing for early treatment and optimization of maintenance immunosuppression. We have demonstrated equivalent long-term pancreas graft survival rates in SPT and SKPT. We believe that this is related to the early diagnosis and treatment of subclinical rejection episodes in combination with careful graft selection and attention to HLA matching in SPT. The Mayo Clinic's experience with surveillance pancreas biopsies has been described by Casey et al. . They observed that minimal-grade rejection in SPT rarely progressed to more severe grades of rejection, and was not associated with inferior graft survival over a period of 2 years when untreated. Although long-term outcomes are unknown with this approach, Humar et al. have shown that chronic rejection is the second most common cause of pancreas graft loss after technical failure . Multivariate analysis showed that the most significant risk factor for pancreas graft loss due to chronic rejection was a previous episode of acute rejection and SPT. Based on these data, we continue to favor treatment of early subclinical rejection episodes in SPT. However, further study and longer-term follow-up is warranted. 1. Conversion from rATG induction with steroid maintenance to alemtuzumab induction with early steroid elimination in the setting of TAC/MMF maintenance immunosuppression. 2. Increasing donor and recipient age. 3. Ipsilateral placement of both organs in SKPT. 4. Biopsy-directed immunosuppression, with liberal use of surveillance biopsies both in SKPT and SPT. 5. Successful transplantation of patients with a “type 2 diabetes” phenotype. 6. A decrease in the annual number of pancreas transplantations being performed in the setting of continued growth in our kidney transplant program. The national trend in decreasing numbers of pancreas transplantations being performed in the United States is disturbing and probably related to a number of factors, including stringent donor selection, increasing obesity, overall improvements in the medical management of diabetes (including better insulin analogues, insulin pumps, and sensor devices), financial concerns, and access issues [14, 15]. The current impetus to alter pancreas allocation guidelines in the United States based on C-peptide levels or "type" of diabetes is illogical and not supported by either outcome or utilization data as the overall number of pancreas transplantations performed has actually declined in recent years in the absence of the above proposed restrictions. Vascularized pancreas transplantation provides an auto-regulating endogenous source of insulin that is responsive to normal feedback controls. It is currently the only known therapy that reliably establishes a long-term insulin-independent euglycemic state with complete normalization of glycosylated hemoglobin levels. Given the projection that many recipients will live well into their second decade following transplantation, the outcome of diabetic sequelae and rehabilitative potential may be determined by the severity and reversibility of their disease at the time of transplantation. Although pancreas transplantation results in euglycemia and insulin independence, this occurs at the expense of surgical complications and chronic immunosuppression, leading to a rise in morbidity. SKPT has become the preferred alternative to kidney alone transplantation in selected recipients with insulin-requiring diabetes because it is associated with superior glycemic control, improved quality of life, enhanced life expectancy, and cost-effectiveness. Due to its metabolic efficiency, pancreas transplantation will remain an important option in the treatment of "complicated" insulin-requiring diabetes until other strategies are developed that can provide equal glycemic control with less or no immunosuppression or less overall morbidity. Disclosures (conflict of interests statement): Jeffrey Rogers receives consultancy fees from Pfizer, Inc. None of the others authors have any conflicts of interest to disclose.